I’ve already broken down the best gifts for students this holiday season, but now it’s time to talk about the best gifts for all the Apple lovers in your life. These are most of the products that I use on a daily basis. Whether I use them on-the-go, while working, or pretty much 24/7, these are some of the best products that have earned a coveted spot in my daily routine. There’s no doubting that the iPhone 6 has an amazing camera, probably the best smartphone camera there is, but in some instances, you just need something a little better and a little more powerful. That’s why I invested in the Sony Cyber-shot RX100M3 this year. While it’s not the best camera you can buy, it’s still one of the top compact shooters available. The RX100M3 features a 20.9MP Exmor R CMOS sensor with a 14-70mm equivalent F/1.8-2.8 lens. It’s also capable of shooting 1080p video. There’s a pop-up viewfinder as well as a tiltable 3-inch display on the back. Finally, the camera has built in WiFi and NFC. The Cyber-shot RX100M3 is currently $798 on Amazon with Prime shipping. When Apple unveiled the iPad Air 2, I’ll admit that I was less than impressed. It was obviously a great tablet, but at the time, I didn’t see how it warranted an upgrade from my first-generation iPad Air. As I started reading reviews and watching unboxings, however, I quickly became tempted to pull the trigger and upgrade. I finally settled on the 64GB LTE model and haven’t looked back since. The thinness and lightness of the iPad Air 2 cannot be understated. If you thought the first generation Air was thin, you’ll be shocked yet again when you pick up the latest model. Performance has also been drastically improved. When I updated my first-gen iPad Air to iOS 8, I began to notice a constant lag throughout the operating system, both in simple things like animations and in more graphically intense games. Thanks to the A8X chip in the Air 2, though, all of these performance issues have gone by the wayside. Of course, the Air 2 also features an improved 8MP camera and Touch ID support, both of which are useful. The display is also considerably improved, something I wasn’t expecting. With the iPad Air 2, Apple finally made the switch to an optically bonded cover glass, whereas all previous iPads had high reflectance air gaps under the cover glass. This change makes for improved viewing in sunlight and improved viewing angles. If you’re looking to buy someone you love an iPad Air 2 (or any iPad for that matter) this holiday season, spring for at least the 64GB model if it’s at all possible. A 16GB iPad is incredibly hard to manage with the increasing size of apps and media content. It’s no fun to have to delete a bunch of apps in order to download a movie to watch on a flight. The iPad Air 2 starts at $499 for 16GB and goes up to $829 for 128GB model with LTE. When on-the-go, especially when I have to take my laptop, I always use the Powerbag Instant Messenger Laptop Bag. On the outside, the bag looks like your generic messenger bag. It’s black with a water-resistant design and a FlyFlat, easy-open pocket. Inside, however, the Powerbag houses a 6000mAh battery, making it incredibly easy to charge your devices in transit. The bag includes built-in 30-pin, Micro-USB, and Mini-USB connectors and a separate USB port for charging other devices (i.e. Lightning cable devices). The 6000mAh battery can charge an iPhone 6 roughly 3 times and an iPad Air twice. To check how much battery the power pack has left, the Powerbag logo on the front doubles as a button that you can push and see how many bars of juice it has left. 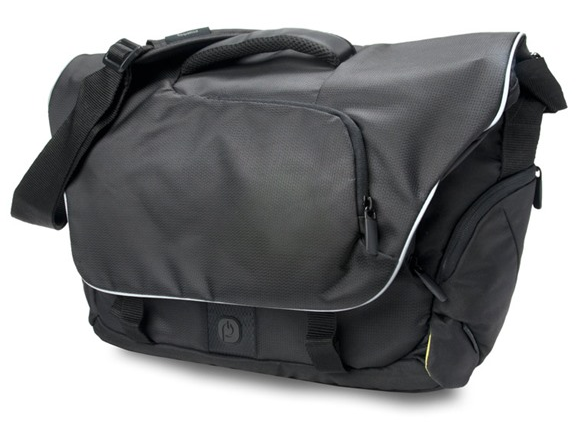 The Powerbag Instant Messenger Bag is currently $67.75 on Amazon and would make a perfect gift for an on-the-go Apple lover this holiday season. I reviewed the MacBook Air nearly a year and a half ago for 9to5Mac, and I’m proud to say that I’m still rocking that same exact model and still getting the same, amazing battery life that I got during initial testing. Apple, of course, has released a slightly improved version since that review, and if you’re going to buy one this holiday season, you should get the latest and greatest for your Apple lover. The MacBook Air is arguably the best laptop available right now. With the 13-inch model weighing in at just under 3 pounds and being just .11-inches thick at its thickest point, the MacBook Air is incredibly portable. It also retains the gorgeous all-aluminum design that Apple fans have come to know and love. The big breakthrough with the 2013 MacBook Air was the Haswell processors. These Intel chips allowed for Apple to improve the device’s performance, increase its battery life, and retain the slim and sleek design. That trio of changes is hard to do all in one upgrade. The MacBook Air is available in 11-inch and 13-inch models, staring at $899 and $999 respectively. A bump to $1,099 and $1,199 increases the SSD storage to 256GB from 128GB in the base model, a change that will surely be appreciated by your media-loving Apple fan this holiday season. When I use that MacBook Air on my desk, which I’ll admit is not incredibly often, I always put it on the Rain Design mStand360. This is an all-aluminum stand that really blends in great on a desk full of aluminum Apple gear. The stand is tilted forward, making it easy to see the display and has a swivel base, allowing you to rotate it a full 360 degrees. The stand also has a hole in the back of it to allow for clean cable management, helping keep your desk even further clutter free. The aluminum build acts as a heat sink as well, preventing your MacBook from overheating. The mStand 360 is compatible with all recent MacBook Pro and MacBook Air models. The mStand 360 is currently $53.90 on Amazon with Prime shipping. An alternative to the mStand 360 is the Twelve South HiRise, which is arguably even better designed than the mStand. It’s currently $69.99 on Amazon. Another Mac accessory I love is the Sabrent 4 Port USB Hub. Made out of aluminum, this accessory also looks great with your aluminum Mac gear. It’s currently going for $14 on Amazon. We’ve said it before and we’ll say it again: if you’re not using a 4k monitor for your daily work, you’re truly missing out. Going from 1080p to 4k, or even to 2560×1440, is like the jump we all made from a non-Retina iPhone/iPad to a Retina model. Once you make the change, it’s impossible to ever even consider going back. 4k monitors have been released in waves over the past two years, with prices continuing to fall. There are currently several affordable 4k monitors on the market, but arguably the best is the Samsung U28D590D 28-inch. I’ve been using it as my main display for the past 6 months and absolutely love it. I reviewed it in detail back in June and praised its 4k @ 60Hz capabilities, something that is still hard to come by in a monitor under $1000. The monitor has dual HDMI 1.4 ports, but for 4k, those are pretty much useless. If you’re using any modern Apple product, you’ll need to invest in a Mini DisplayPort/Thunderbolt to DisplayPort 1.2 converter, which can run about $10 on Amazon. Of course, if you truly love your Apple fan, you could always get them the new Retina iMac as a gift, but starting at $2500, that’s a pretty expensive gift (not to mention the supply issues as we head into the shopping season). The Samsung U28D590D 28-inch monitor currently goes for $479.99 on Amazon, although we consistently see it at even lower prices. Keep an eye on 9to5Toys for those latest deals. 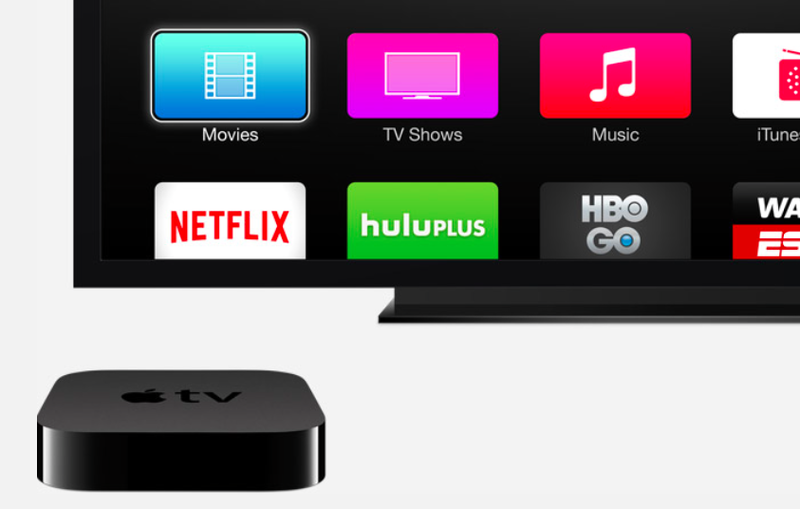 I own just about every set-top box there is and none of them even come close to competing with the Apple TV for me. The Roku and Chromecast may make better “budget” options, but the Apple TV is still by far the best overall experience for Apple users. With an always-expanding lineup of channels, it offers support for nearly ever streaming service (minus Amazon Instant Video, although you can AirPlay from an iPhone, iPad, or Mac). AirPlay allows users to instantly beam content from their iPhone, iPad, or Mac to the big screen, allowing everyone in the room to see the latest home videos and vacation pictures this holiday season. The interface on the Apple TV is as simple as can be and will be familiar to anyone who has used an iPhone or iPad before. The device ships with an elegantly simple remote, as well, though the Remote app on the iPhone may be a better option for some people especially when typing. When Apple announced its purchase of Beats earlier this year, I was tempted to give the company another chance. I’d never been a fan of on-ear headphones because I thought they were big and cumbersome to carry and not all that comfortable. With these opinions in mind, I decided to give the Beats urBeats earbuds a chance. Having always just settled for the included Apple earbuds and EarPods, I was hesitant to spend $100 on earbuds, but I did and was not disappointed. The urBeats offer the same, bass-heavy sound that I remember from using Beats Studios a couple of years ago, although to a lesser extreme. The comfort is also unbeatable. I’d always thought that Apple’s EarPods were relatively comfortable, but the urBeats have them beat in every aspect. Coming with four sets of interchangeable ear tip fittings, the urBeats should fit pretty much everyone. The urBeats, of course, work flawlessly with all Apple products. The in-line microphone works great for phone calls and switches easily between music and incoming calls. The play/pause/skip/volume control toggles also work great and operate just like EarPods. Beats urBeats are currently going for around $89 on Amazon, varying slightly by the color you choose. The Space Gray option looks pretty slick, if I do say so myself. Now this product is actually going on my wish list this holiday season. Having never used any sort of fitness tracker before, the addition of the Health app on iOS 8 has intrigued me enough to give one a try to start actually tracking my fitness. Judging by various reviews around the Internet, the Jawbone UP 24 seems to be the most popular and most affordable fitness tracker out there. The UP 24 communicates with your iPhone via Bluetooth and records information in the Jawbone app. Sleep and step data syncs to the Health app on iOS 8. You can also track your food, drink, and calorie consumption with the app and be told just how bad you’ve been eating everyday. One of the coolest looking features to me is the ability to connect with your friends and family and compare progress and climb up the leaderboards. With my iPhone 5 and iPhone 5S, I was a huge fan of the Lenmar Meridian battery case. It was sleek and powerful enough to recharge my phone more than once. When I upgraded to the iPhone 6, however, I was forced to find another solution because of the lack of MFI-certified battery cases from reputable brands like Mophie and Lenmar. A quick Amazon search led me to the Anker 10000mAh external battery. This specific Anker model can charge the iPhone 6 nearly four and a half times or the iPad Air once. There are more powerful, albeit larger, Anker models available that can charge the iPhone nearly 10 times and the iPad Air twice. I chose the less powerful 10000mAh pack, however, because it’s more portable than the alternatives. 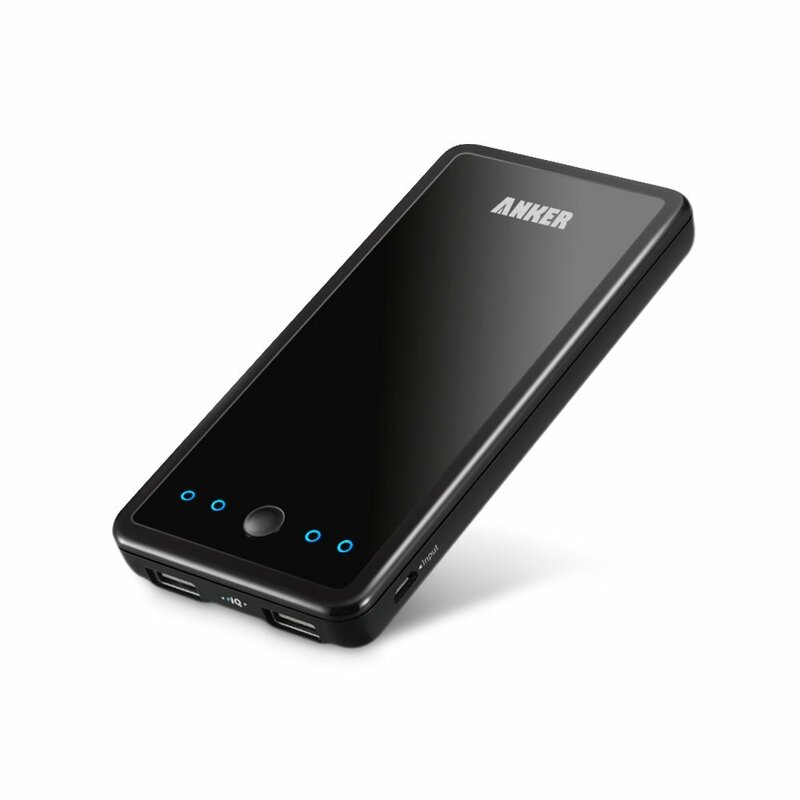 The 10000mAh Anker battery pack is currently just $25.99 on Amazon, while the 25600mAh pack is $69.99 at the moment. This one also got a mention in my student gift guide this year, but it’s something that I use nearly everyday. Before buying the Kindle Paperwhite, I had probably read one book this year, if that, but since I bought the device in June, I’ve read countless books. I was never a fan of reading on the iPad, even the newer and lighter iPad Air. The Kindle Paperwhite starts $119 for the WiFi-only model with special offers. Without special offers, the WiFi-only model runs $139. For built-in 3G, you’re looking at $189 with special offers and $209 without. That’s a wrap on my personal holiday gift guide this year, but be sure to catch up with each of our holiday gift guides this year and follow 9to5Toys.com for the latest deals.